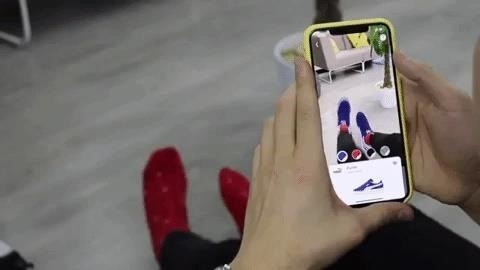 A new mobile app from augmented reality commerce company Wannaby, appropriately named Wanna Kicks, uses smartphone and tablet cameras to show users what shoes look like on their feet from various angles in real time. "We use sophisticated 3D geometry algorithms together with neural networks to identify the position of the shoe in a space," said Sergey Arkhangelskiy, CEO at Wannaby, in a statement. "Those algorithms are the secret sauce of our application and our main innovation. Then we combine it with the information about the rest of the foot to decide which parts of the shoe are occluded." "The finishing step is the rendering of the shoe itself," said Arkhangelskiy, a former software engineer at Google. "We rely on our custom physically-based rendering engine with extensive support of different materials so that you can tell the difference between the rubber sole from the fabric finish on the upper part of a sneaker." Just like trying on actual shoes, the app works better when users are not wearing shoes. For the most part, the virtual shoes look like they are actually on your feet. In my limited testing, at times my toes would stick out, but on subsequent attempts, the tracking was more accurate. More importantly, the app gave me a good impression of what the shoe would look like on my feet. 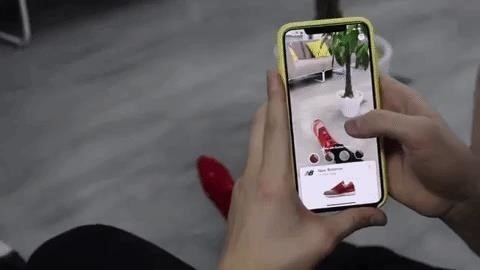 So we can now add shoemakers to the list of companies that can look to augmented reality to instill confidence in consumers regarding their online purchases. In addition to trying on cosmetics, consumers can now use AR to see what furniture from Ikea and Target will fit in their homes, how a new Porsche or BMW will look in their driveway, and preview electronics and other goods from Amazon and Jet.com. As technology's capabilities advance, the scope of AR marketing will be limited only by the imaginations of sales and the marketing teams tasked with creating these kinds of sales experiences.